Margarita’s Mexican Restaurant is celebrating Cinco de Mayo for five days with a variety of $5 specials each day! On Cinco de Mayo, Friday, May 5, 2017, Margarita’s will have all you can eat nachos before 4pm as well giveaways and more! 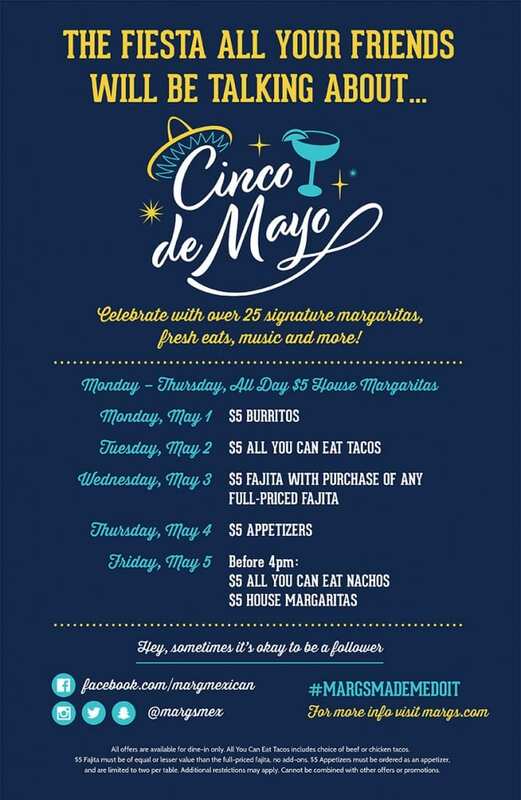 Even better, Margarita’s is hosting Cinco Days of Goodwill, a five-day fundraiser from April 30-May 4, 2017 where 20% of guests’ checks are donated to Goodwill Industries. Just make sure to mention Cinco Days of Goodwill to your server. There are eight Margarita’s locations in Massachusetts including Medford, Revere, Lexington, Waltham, and Weymouth as well as locations in five other states. For the complete location list, please head here. For more information about Margarita’s Mexican Restaurant’s Cinco de Mayo fiesta, please head here.